Whether Doom is one of your old favorites and you're coming back to it or you've never played before and want to give it a try, there are some basic things you need to download or otherwise obtain in order to play this classic game properly on a modern PC. First and foremost, you need the officially licensed IWAD file for at least one of the four Doom retail releases: Doom, Doom II, TNT: Evilution or the Plutonia Experiment. WAD files contain the basic game elements like textures and map data, IWADs being the retail files that can't be legally edited or released for free and PWADs being modifications or additions produced by the gaming community. I can't post here any sources to obtain the IWAD files for free because obviously that would be warez or piracy and be illegal, but I can however tell you where you can get them all pretty cheap. I obtained my copies of the IWADs from a compilation disc called Doom Collector's Edition which Amazon appears to be selling for around $26.00 USD at the moment. (I actually got mine a few years ago at Wal-Mart.) The best deal in my opinion would be to go to Steam and get the Doom Pack Complete for about $35.00 USD which will get you all 4 IWADs, the Master Levels, Doom 3 and Resurrection of Evil. Not a bad price if you ask me. Or each of the individual IWADs for the original games can be purchased separately from Steam for around $10.00 USD each. You could also check someplace like ebay or craigslist. 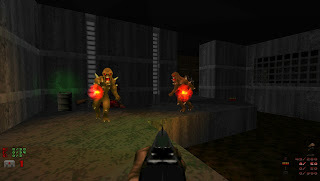 Wherever you get the IWADs however, they will be the only things mentioned in this blog regarding classic Doom that you will ever have to pay for. Anything else I will describe here is produced by the gaming community and thus is FREE. Much better. This screenshot was taken at a resolution of 1360x768 while running the game with GZ Doom, a sourceport by Graf Zahl which utilizes open GL and has a load of options that will allow you to customize exactly how the game will look. There are a lot of other sourceports available for free on the web, but GZ Doom is the one I prefer so it's the only one I will describe in any detail here. In the Doom community debates rage on about which sourceport is best and you can learn more about the others by going to the Doomworld Forums and investigating on your own if you prefer. I prefer GZ Doom because it is one of only two sourceports that I am aware of that also has 3D lighting effects. 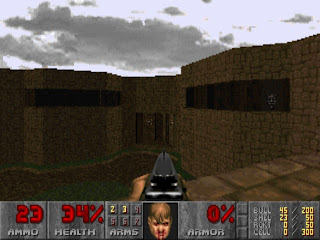 The other sourceport with such graphics effects is Doomsday, and in some ways it could be argued that it looks better than GZ Doom, but I don't use it because its front-end limits the number and type of add-ons I can use and how they are loaded. There's also the fact that I have a widescreen monitor and despite all its boasts of high-res graphic wonderment Doomsday does not support widescreen resolutions. 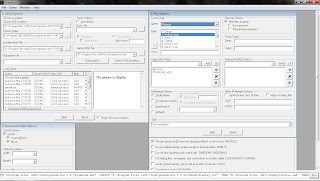 GZ Doom can be launched with a number of front-ends (designed for Z Doom) that provide me with virtually unlimited options, including the ability to load .zip files containing any number of add-ons. More about that in just a minute, because in my opinion the front-ends are just as important as the sourceport itself. Another good thing about GZ Doom is that it is still very much maintained by its creator and the community and updates and new versions such as those by the DRD Team are constantly available. 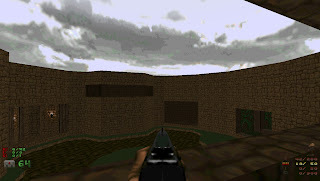 GZ Doom is actually based upon the Z Doom sourceport (which does not use open GL) but as such virtually anything that can be used with Z Doom can be used with GZ Doom. You can learn more about the original sourceport at the Z Doom Forums. It's my hope that I'm giving enough info here that a new player could get started with this fairly easy, but don't be afraid to post a comment if you have a question. I'll definitely do my best to answer. A great source for info and answers is also the Doom Wiki. Normally Doom on Windows is started through a command-line interface (even with Steam, though you at least get a shortcut icon), but personally I prefer a nice and easy GUI so I use a front-end launcher. 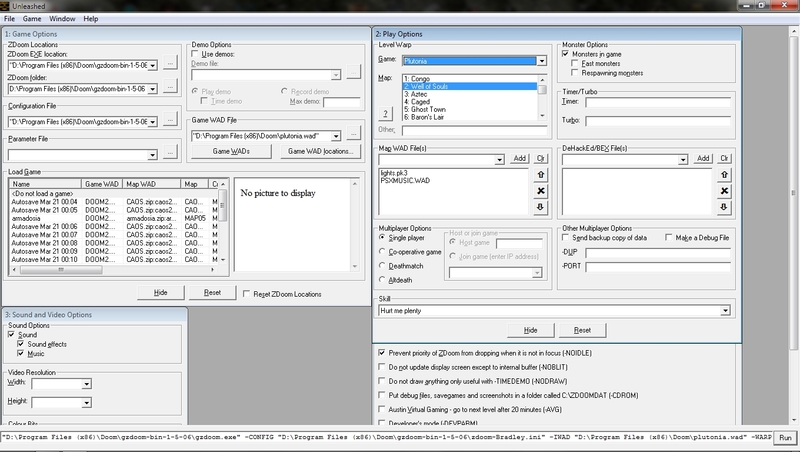 This is the GUI for Unleashed, a launcher designed for Z Doom. But by simply setting it to point to the GZ Doom .exe rather than the Z Doom .exe it can easily be used with my favorite sourceport, GZ Doom. Likewise, ZDL3a can be set up to launch GZ Doom as well. The GUI for ZDL3a is much more compact and less cluttered, making it less confusing and more intuitive for beginners. 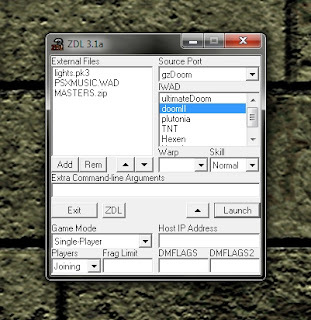 I prefer to use ZDL3a because it also allows the loading of WADs or other resources that are stored in .zip files, but with either of these launchers you can load virtually any number of plugins, add-ons or PWADs that you want to customize your Doom experience very specifically. With these launchers you can virtually play Doom however you want. When you first get started you'll need to set up the launchers with some info regarding the file locations of the sourceport executable and any IWADs and PWADs you'll be wanting to use, but this is fairly simple and only needs to be done once (unless of course you move those files later). If you got your IWADs from Steam they can be found in the Steam directory in the files steamapps/common. To get the 3D lighting effects of GZ Doom, the file lights.pk3 that can be found in you GZ Doom folder must also be added to the list of add-ons to be loaded. Nice write-up ya got here. Though you didn't mention how to get over the eyestrain issues involved in going back to 1996 graphics. Funny you should mention eyestrain, though, because it's actually just the opposite for me. When I play a newer game at a beautifully high resolution, any text involved is generally so small that I need to wear my glasses in order to read it for extended periods of time. Oh, I can read it without my glasses too, but if it's an RPG like NWN where only parts of the dialog were voiced and thus I'm constantly reading dialog that may very well be integral to completing the game, it's not long before I have to put my glasses on in order to avoid feeling like I'm going blind. With Doom however, the original graphics were basic enough that even at the higher resolutions afforded by a sourceport I can play all day without my glasses without any ill effects. "but then, maybe the fact that I'm not wearing my glasses is why the old game still looks good to me... "
You know, before I got my vision corrected, I could never see the appeal of HDTV or Blu-Ray. With my glasses on, though... yeah, I see why it's getting big. The old 320x240 16bit games were so godawful looking that you could have astigmatism and barely notice. I can agree to an extent about the graphics not being up to today's standards but the thing that I like about those classic titles (not just Doom) is the gameplay. Doom 3 looked so much better than it's predecessors but I found the gameplay lacking. Perhaps it was more realistic but I found it less fun and more frustrating. My biggest gripe ... constantly getting hung up on all that beautiful eyecandy (pipes and barrels etc.). No more blazing away, strafing to beat the band while a bunch of pinkys chomped at you. I guess the classics offer something to an old guy like me that might not be noticed by the younger set. I played them back when those 'crummy graphics' were THE kickass graphics of the day and everyone was scrambling trying to afford hardware to run them at their most taxing resolutions. I remember my first 3DFX SLI machine ... bleeding edge for almost 1/2 a year. Resolutions like 1280 x 1024 were the absolute stratosphere. Things certainly have changed over the years but sit me down with one of those good old games and the memories flow in like a tide. First, thanks for posting a comment. I've spent the last day or two debating whether or not to bother typing another post, thinking that it's likely nobody would ever read it. It's great to hear from a kindred spirit! Like my friend Nos, I play a lot of the newer games too. I've put more money than I can really afford into building my own custom computer capable of running them. I've even tinkered with producing a few minor additions to the popular Bethesda games. 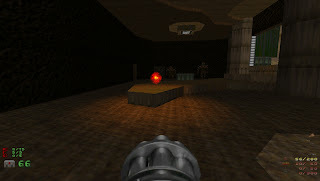 But like you, I often find myself longing for a more basic style of gameplay that still provides me with a sense of 3D exploration, and the Doom classics provide exactly that. Fans of more recent games might argue that the original Doom series is far too basic and thus boring, but I strongly disagree. I've played many well-crafted sets of maps where the authors have used the basic elements of the game in such ways that they had me practically pulling my hair out trying to find all the secrets and solve all the puzzles. It's these quality maps that I intend to describe in more detail in upcoming posts. I hope fans of these games will find these posts useful, and perhaps will discover some old gems that they may have overlooked the first time around.